This week the kids are off from school (yay!) and we are getting ready for Thanksgiving. Each of my kiddos have special things that they are in charge of making for the big day, so I am really pleased to have a few days together to hang out and bake with them. My son makes the pecan tassies, my older daughter makes the pumpkin pie, and my little girl is in charge of making brownie bites. I love how the house smells during Thanksgiving week! 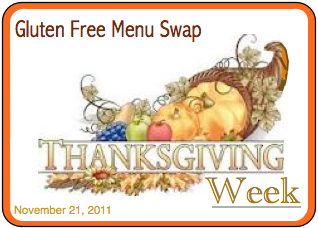 The Gluten Free Menu Swap is being hosted by Heather of Celiac Family. The theme is Thanksgiving. If you menu plan gluten free, we would love to have you join in! If you are wondering why we are having breakfast for lunches this week, it is because I will be making double batches so I can restock my poor empty freezer for school day breakfasts. Lunch – We generally have appetizer snacks as we prepare our big feast. Love it!